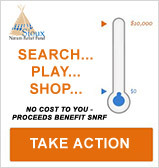 Sioux Nation Relief Fund newsletters allow us to share with our donors the beneficial SNRF programs that help the Sioux Indians on the Northern Plains. These quarterly newsletters focus on our program services and our family of Program Partners -- the Indian people living in the communities we serve that volunteer their time to meet the needs of their people. We hope that by sharing stories of these dedicated people, along with pictures of them and their communities at work, we will open a window into life on the reservations. We hope to show all those who care about Sioux Indians that together we are working towards our Mission: "To help Native American people improve the quality of their lives by providing opportunities for them to bring about positive changes in their communities".